Observations, rants, and musings by Joe Siegler. I set up all this stuff on the table in the 3D Realms conference room. First off, I didn’t have enough room on my desk for all this stuff, plus I had two Duke posters behind this for the pic. 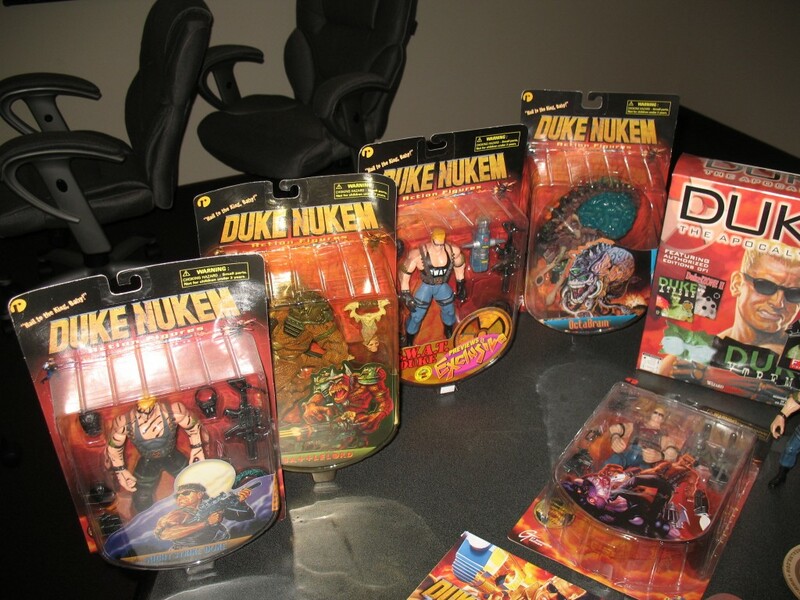 This is mostly a shot of the various original Duke 3D action figures… Nightstrike Duke, the Battlelord, SWAT Duke, and the Octabrain. Laying down is a boxed “regular” Duke. This was my stash except the Nightstrike variant of the figure came from Scott Miller’s stuff. We only had a couple of those, and I really wanted to present all the figures together. 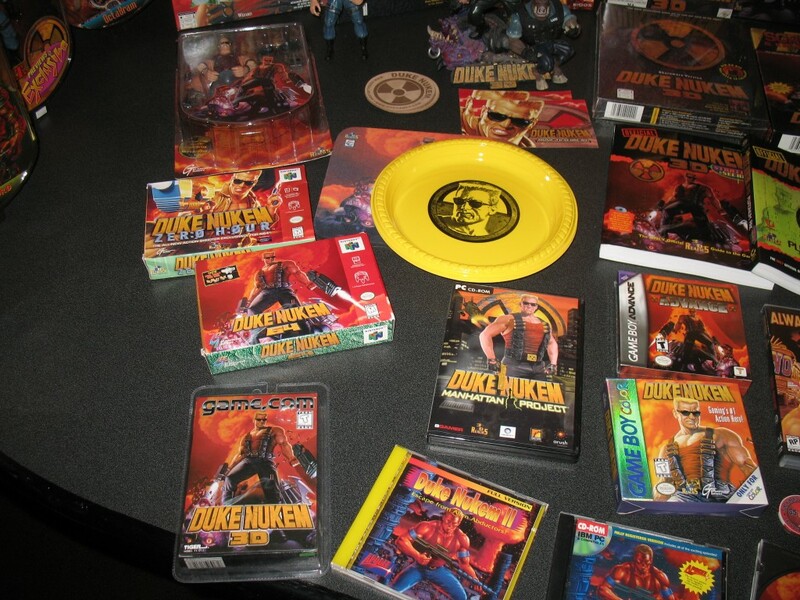 Duke Nukem plastic plates (these were part of a promotional package made up for the Time to Kill PS1 game. There are pics of the rest of the set (which doesn’t survive) in the legacy 3D Realms Photo Gallery. Various items. Starting in the upper left hand corner and going clockwise…. 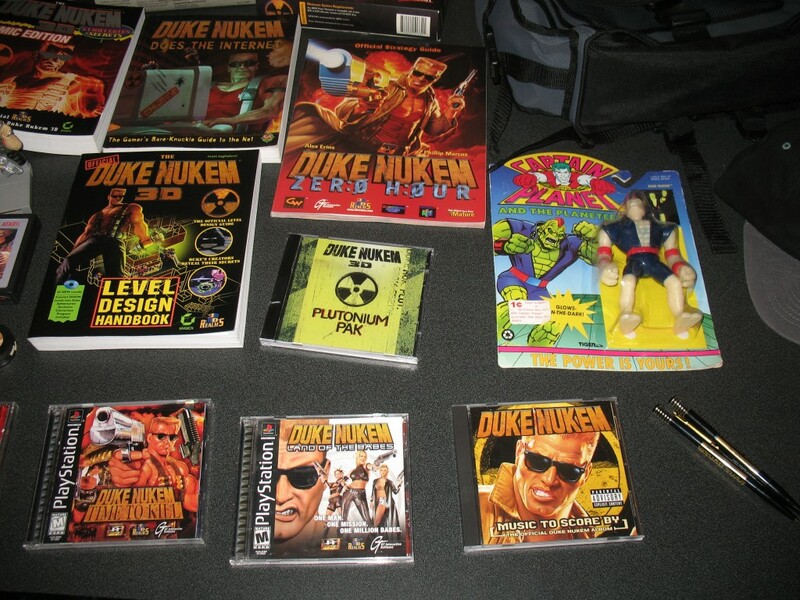 Duke Nukem 3D strategy guide. The original one, which covers Episodes 1-3 of Duke3D. The Plutonium PAK strat guide. Covers ONLY Episode 4. Intended for people who bought the first one. 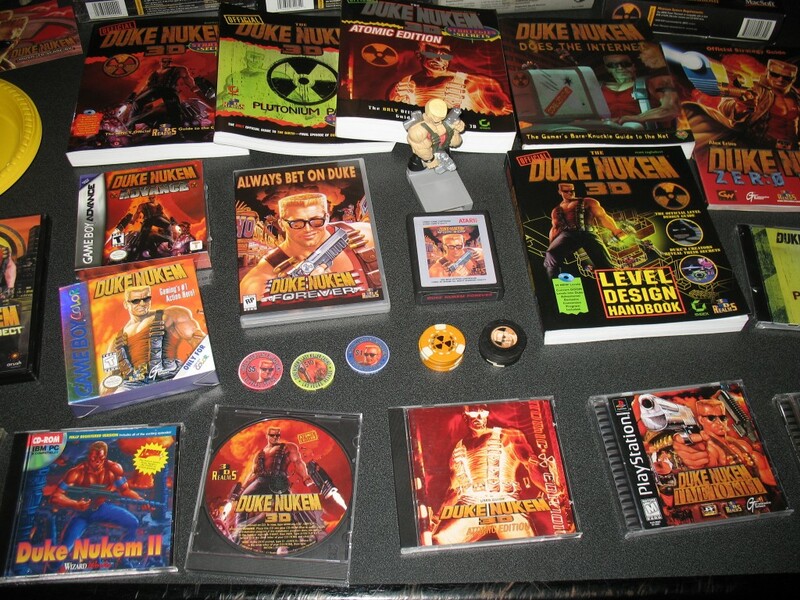 Duke Nukem Does the Internet book. Duke Nukem Forever Atari 2600 cartridge. This was an April fool’s joke I did. You can read about that here. 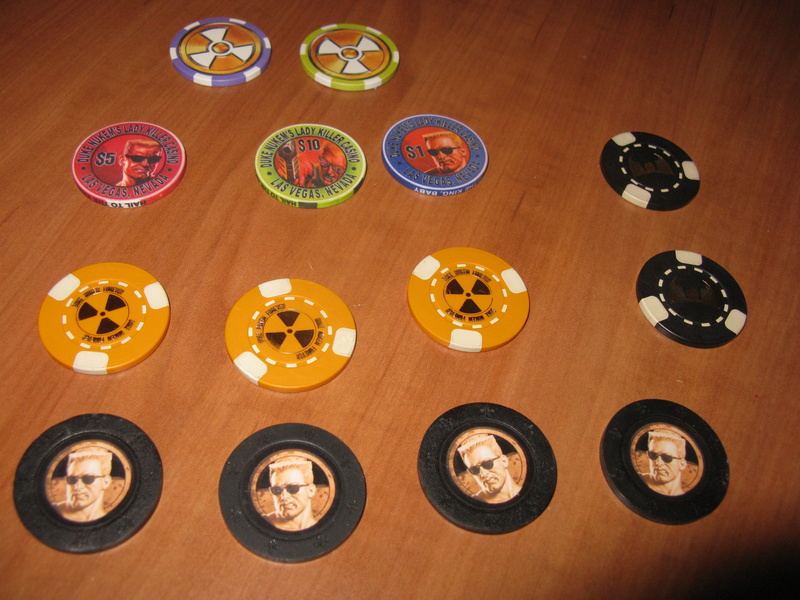 Colored Duke Nukem chips – these are chips George made up to have for 3DR poker games at his house. 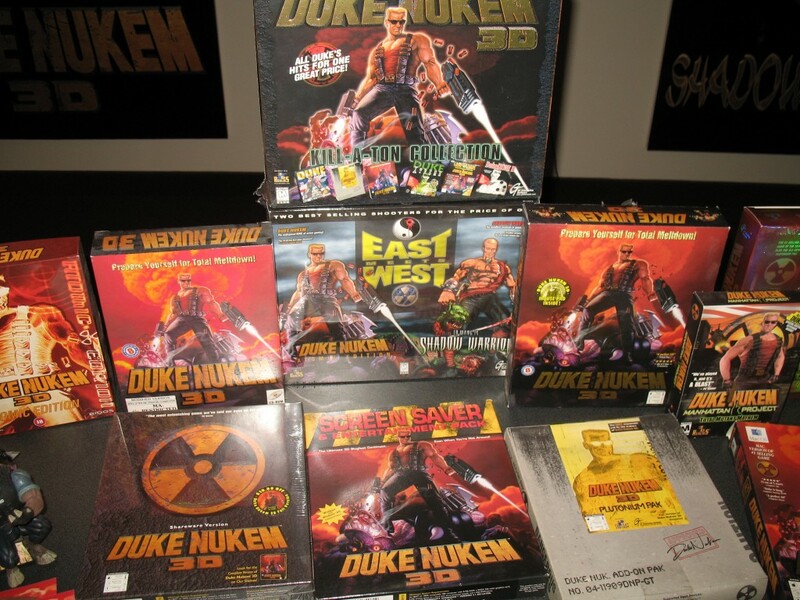 Duke: The Apocaypse retail box – Contained two other Duke addon collections (Duke Xtreme & Duke Zone II) plus a T-Shirt. Came from Scott Miller’s stash. 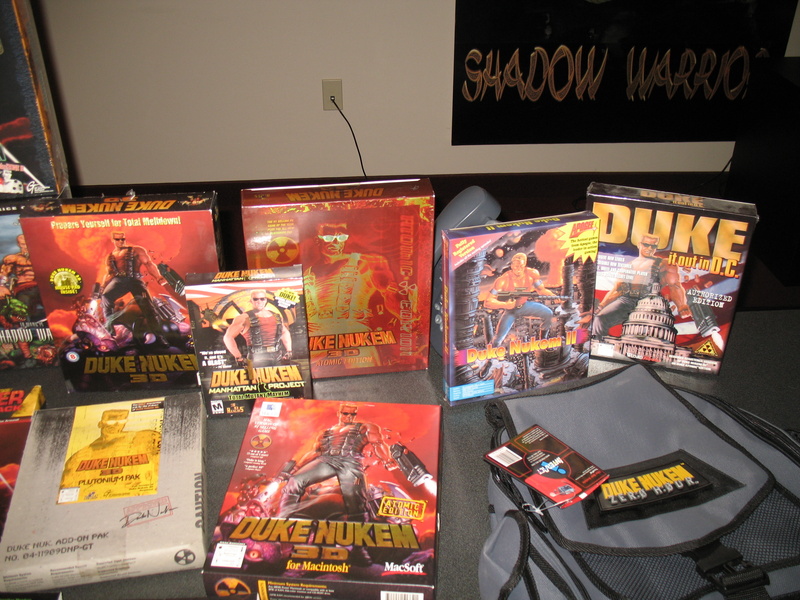 Various Duke retail game boxes. Duke Nukem: Zero Hour backpack. This was a promotional item made never for sale, but as a giveaway type thing for retailers and the like back when Zero Hour was new. These other pictures were not part of the original “photo shoot” for reasons that will be obvious when you read about them. 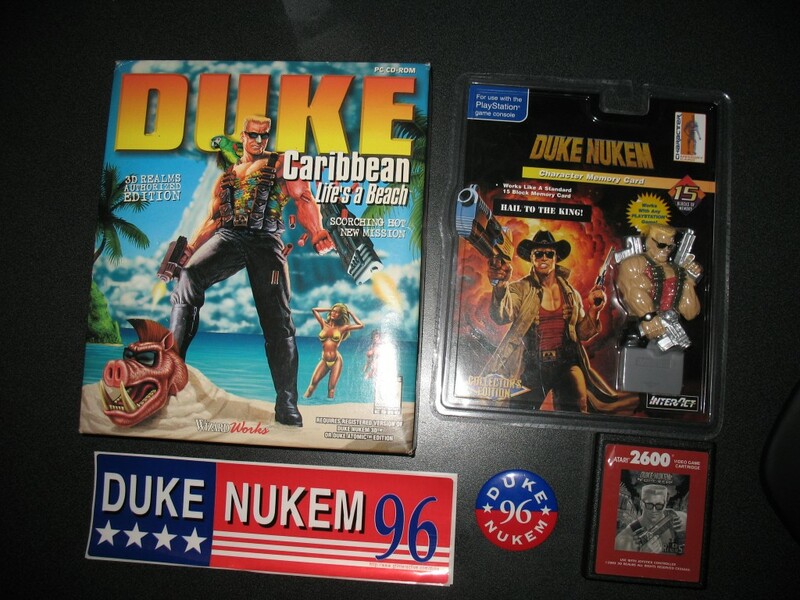 This first one shows several casino chips around Duke Nukem. This picture was taken on June 20, 2011. I got out all the Duke chips I had. The two on the top came from the DNF Deluxe edition package. The color ones in the second row were ones that George had made up for playing poker at his house, which was a frequent event. The others were promotional items. The black and yellow ones with the white parts around the edge were from a fake casino table that was set up on the Gathering of Developers lot at E3 2001. 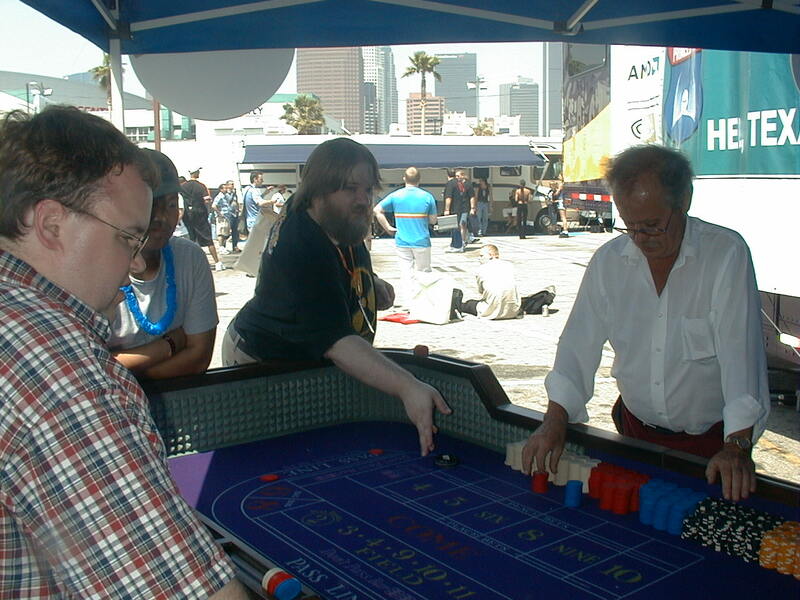 There’s a picture of Lee Jackson playing the fake craps table here which shows several of the chips. I can’t remember where the four black ones on the bottom came from. I think that’s some other promotional thing that I can’t recall the origin of. 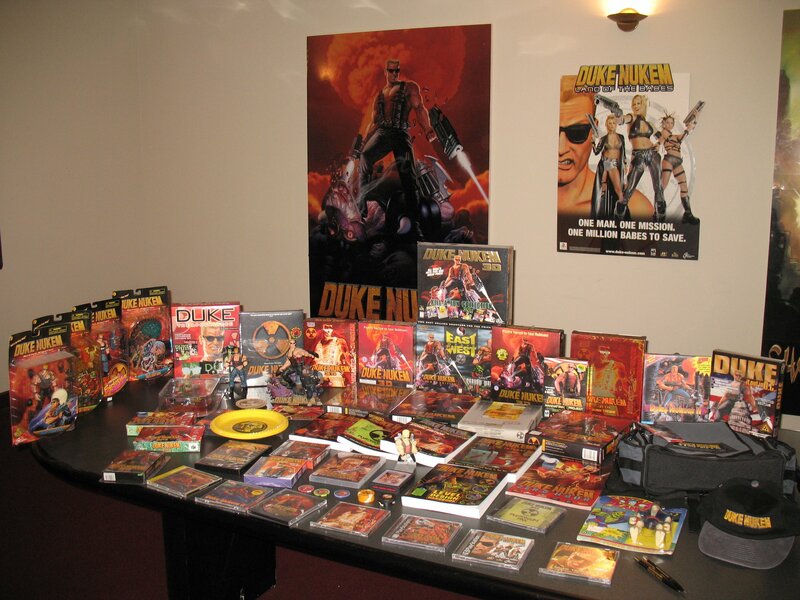 After Duke Forever finally came out in 2011, I gathered together all my DNF stuff and took a similar picture as the pictures above. Here’s that picture, with commentary.. 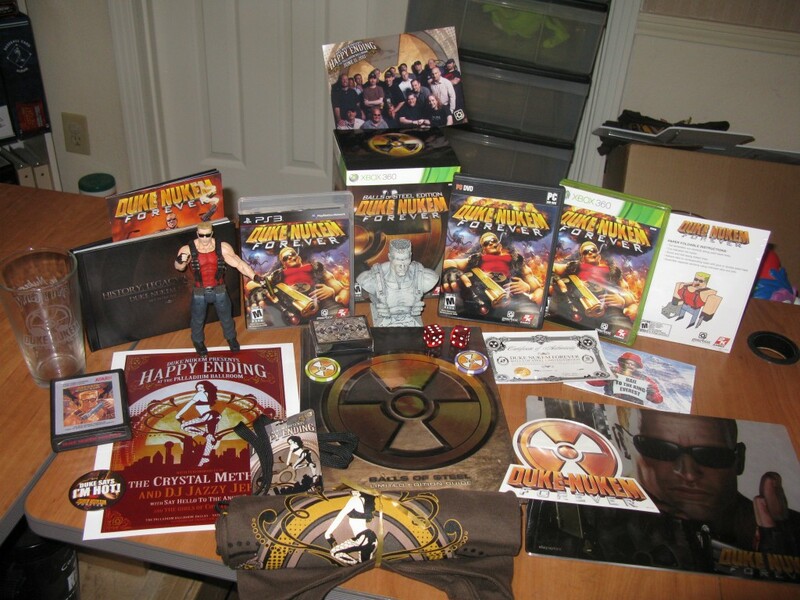 The “Happy Ending” items were things given away at the release party, which was a hell of a lot of fun, actually. A poster, my lanyard, and a t-shirt are those items. PS3 / 360 / PC editions of the game. While only the 360 version is shown in the deluxe edition, I’ve since acquired the others, too. The picture in the back was something they were doing at the release party where people could have their pics taken in front of that logo. We gathered as many of the 3D Realms staff that were in attendance for that picture. There’s a super high quality DNF mouse pad in the lower right hand corner that Gearbox was selling for awhile. It’s REALLY well made, and I still use it to this day in 2015. Looks as good as when I first got it. The book in the middle is the hardcover version of the DNF strategy guide. I’ve since acquired the paperback version, too. 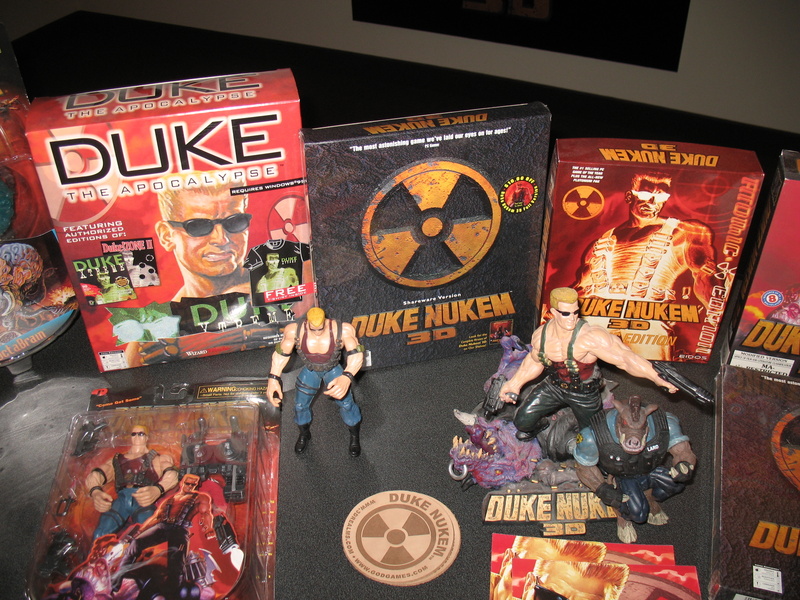 One of the Duke Nukem Forever “Duke Nukem” action figures. Everything else I’m pretty sure was is the “stuff” that came in the “Balls of Steel” edition. I’ve since acquired a couple of DNF shotglasses that aren’t in this picture. I also found copies of several old Duke Nukem T-Shirts we made up for various E3’s and all that. Decided not to take pictures of them, as I’d have to take ’em out of the plastic they’re in, and they don’t look good unless you take pictures of both sides, etc.. Basically decided to skip the T-Shirt pics, because they wouldn’t look very good. All of the Duke pictures above were preceded by my “Shadow Warrior” swag picture. Not nearly as much stuff, but given I took the pic, I thought I’d include it, as well. 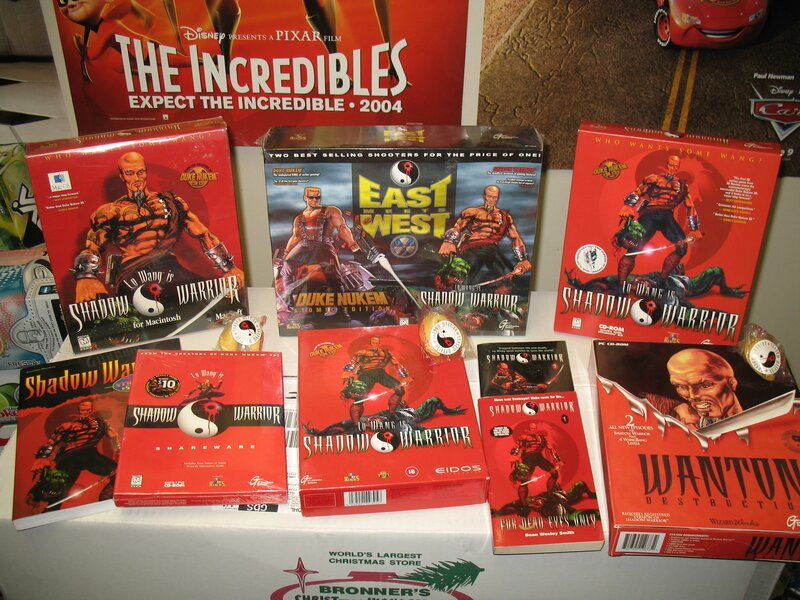 Front Row: Shadow Warrior Strategy Guide, Retail Shareware box, one of the Shadow Warrior fortune cookies, the European Shadow Warrior box, another fortune cookie, the two Shadow Warrior novels, and the only existing copy of a retail box for the Wanton Destruction expansion pack (it was a prototype). After my version of 3D Realms fell apart in 2009, and I lost my job.. I eventually had to sell off a lot of this stuff to help keep the finances working. When you’re unemployed for over three years, there’s a cost. But I kept some of the stuff, I couldn’t get rid of all of it. That’s a look at my “Duke swag”. If you have any comments, please leave them below.